Sep 11 may be your last chance to #VoteForChange and say “No!” to cronyism and greed (whether it’s the MIW’s or your own). 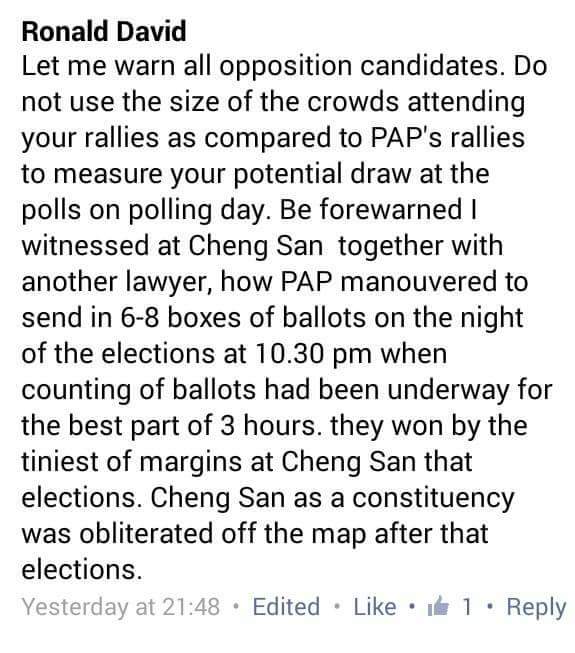 I will not be surprised if the #PartyAgainstPeople stoops to a lower level than #gerrymandering to retain its parliamentary majority in the next election. #Blackout on polling day, anyone? The #PartyAgainstPeople has repeatedly emphasised that Singaporeans should vote for their self interests (enlightened or otherwise). In that case, there are even more compelling reasons to vote in the opposition. You may feel secure in your employment/career right now. Your assets may have appreciated. But these could change if you give a blank cheque to the #PartyAgainstPeople. The CPF minimum sum withdrawal age may be raised further to 80, provided you live long enough to see that day. The population target (sorry, planning parameter) may be revised to 10 million. Your children may need to pay $1 million to buy a 3-room HDB flat. Sounds like fear mongering, right? 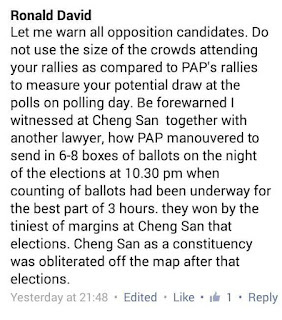 Well, who says scare tactics are the exclusive domain of the PAP IBs and supporters? It’s time to beat them at their own game. It is thus precisely for the sake of your own interests (and your children’s) that you should not give the #PartyAgainstPeople the mandate it has requested to do as they please. So ask yourself: if you don’t vote for change this time round, will you get another chance to make it right the next time?